When you live at the end of the world, just hearing your country mentioned in a non-traditional context provokes an irrational mix of excitement and pride. For the people of the United States, this is probably not a familiar sensation; their culture has permeated all others. Chile, on the other hand, remains somewhat unfamiliar to the rest of the world. Wine buffs, soccer enthusiasts or copper investors will have heard of us, but we aren’t really present in humanity’s collective unconscious. Imagine our reaction, then, when we heard that the new American Girl of the Year had Chilean parents! The general public were surprised, but the scientific community was euphoric. 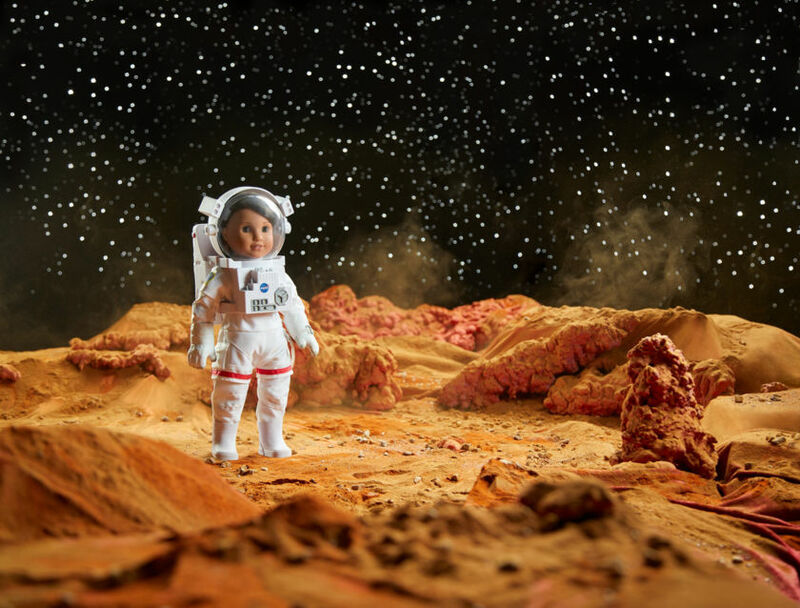 Luciana, a little girl who dreams of going to Mars and has a telescope and a space laboratory of her own, has heritage from this side of the Andes. American Girl creates its Girl of the Year dolls as fully-fleshed out historical or contemporary characters with age-appropriate companion books. "In every book—and we’ve published more than 800 of them!—the words we write are chosen with intention and purpose, to inspire girls to think about who they are and who they want to be. From creating beloved characters who become role models to partnering with pediatricians and other experts who offer advice for each stage of girlhood, we give girls the confidence and courage they need to face challenges," the company says. “Finally!” I said to myself. My own headline read: “Hey! The world knows we exist, AND THAT WE DO SCIENCE!” Of course, I immediately linked the story with the country’s recent strides in science and technology; and why not, considering our exceptional geographic and climatic conditions for observation of the universe. 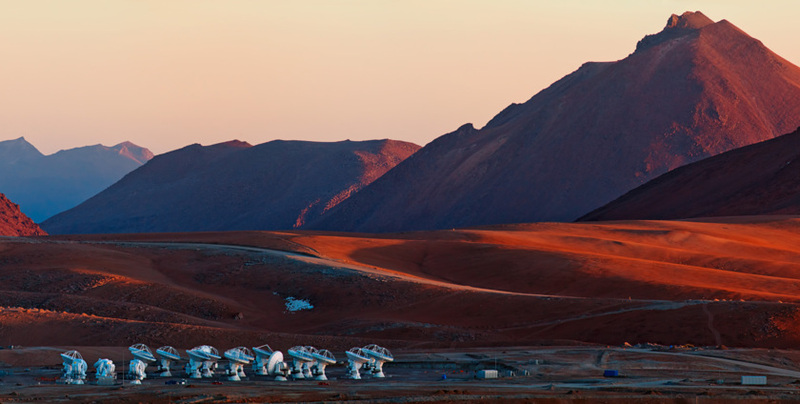 The Atacama Large Millimeter/submillimeter Array (ALMA), overlooked by the Andes. Northern Chile is home to 40% of the world’s astronomical observation infrastructure, and by 2027 it is hoped that this figure will reach 70%. We have clear skies for 300 days per year, as well as a dry atmosphere and high-altitude plateaus, making the region perfect for gazing at the universe and for providing Luciana a solid back story. Sadly, this story appeared nowhere in the first book about Luciana. Nor did Chilean culture or identity feature in her psyche in any way. The author of the books about Luciana, in an introductory video about Luciana, does not mention her ancestry or ethnicity at all. In Luciana's story, Chile was mentioned only as a place where her parents wanted to adopt a child, a baby girl who turned out to have a heart defect and so needed to be brought to the USA for medical care. (Chile has excellent medical care, by the way.) Luciana's link to Chile was incidental: she could have been from any country. All of the Chilean journalists churning out pages of news about Luciana decided to draw a line right there and then, resignedly assigning her to the pile of freak coincidences on top of There’s Something About Mary and Jurassic Park. You are correct that Luciana’s heritage is not the main focus of her story. Our primary goals for this character were to build excitement around science and space exploration AND to show that girls are interested and successful in these fields. Given that STEM fields are heavily dominated by boys/men from an early age and the viewpoint that girls/women aren’t good at them, we wanted Luciana and her stories to serve as a role models for today’s girls and empower them to defy these stereotypes. It’s also important to note that Luciana herself is not an immigrant from Chile—she is an American of Chilean heritage. Our materials on Luciana say that she is of “Chilean descent,” so it’s unfortunate if some of the media coverage on Luciana mistakenly reported that she is from Chile or a first-generation immigrant. She is American born and raised, and her first two books are set in American settings: Space Camp in Huntsville Alabama, and the fictional Youth Astronaut Training Center in Virginia. These settings did not offer an opportunity to depict Luciana’s Chilean roots. Her third book (Luciana: Out of This World) is due out this May, is set in Chile, features a Chilean Astrobiologist, and describes several Chilean family traditions. We consulted with a Chilean culture expert on the story, so we hope you’ll agree that it does a good job of accurately representing Luciana’s Chilean extended family and heritage. I couldn’t agree more with the importance of building role models for girls. But if your fictional character's family has an ethnic identity, you should try to honor it, and make it speak for itself in the story, otherwise it turns out to be meaningless. (A German character in the book had more ethnic identity than Luciana had, teaching her hab-mates German figures of speech.) Needless to say, I’ll be waiting for that book in May. Latin-American scientists exist in the United States, after all, but not in proportion to society. Latina girls need to see that they can be authentically themselves and be in STEM careers, too. With Luciana, American Girl has created a product that thrills and excites girls about STEM, but they did not follow through on the promise of her identity to explore the special challenges she might face in pursuing her interests in science and technology as a child of immigrants, as a girl in science from other non-first world countries in general, and as a Latin American in particular. I'd like to show those Latina girls that here in Chile, we have real Lucianas made of flesh and bone. The best flesh, and the best bone. Ruiz is the first of her kind. 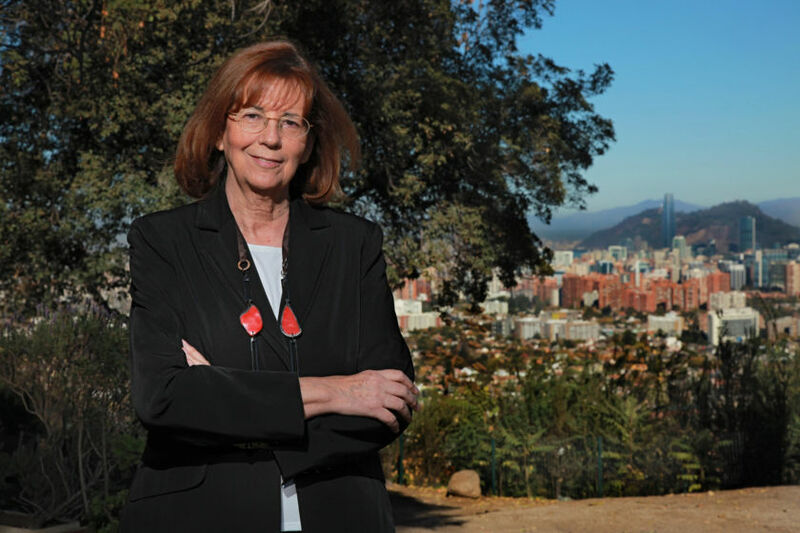 She is the University of Chile’s first female astronomer, the first WOMAN to receive a PhD in Astrophysics at Princeton, the first woman to win Chile’s National Prize for Exact Sciences, and the first female president of the Chilean Academy of Science. This amazing woman, who last year was also awarded the L’Oréal Unesco Award for Women in Science, made the discovery in 1997 of the first brown dwarf, a category of celestial body of insufficient size to sustain nuclear fusion reactions, but which, unlike planets, radiate their own heat and cause them to emit light. These bodies continue to be objects of study and fascination among scientists around the world. María Teresa Ruiz has also written a number of books for the communication of science. These are truly holistic encyclopaedias of the universe, which bring together not only theories and concepts, but also stories, poems, myths and interpretations of the sky and its mysteries from local ancestral cultures. Her most recent publication is called Hijos de las Estrellas (Children of the Stars) because, according to her, this is precisely what all of Earth’s inhabitants are. Ruiz is also an academic, and has made it her responsibility to educate new generations of the country’s women scientists. The University of Chile, where she teaches, is one of the most prestigious institutions in the country and the wider region, and this year for the first time saw record numbers of women enrol in STEM courses. In 2013, the percentage of students enrolled in the university’s Faculty of Physical and Mathematical Sciences was just 20.1%. Now this figure has risen to 32.8% in just five years, and it would be unfair not to acknowledge the contribution of women role models in Chilean science, as well as the efforts made by Chilean politicians to increase their visibility. Earlier this year, Chile held the Congreso Futuro, an initiative organised by the Senate to present the latest in science and technology to the public. The organisers pledged to include an equal number of men and women on the panels and talks, a promise which was duly kept. 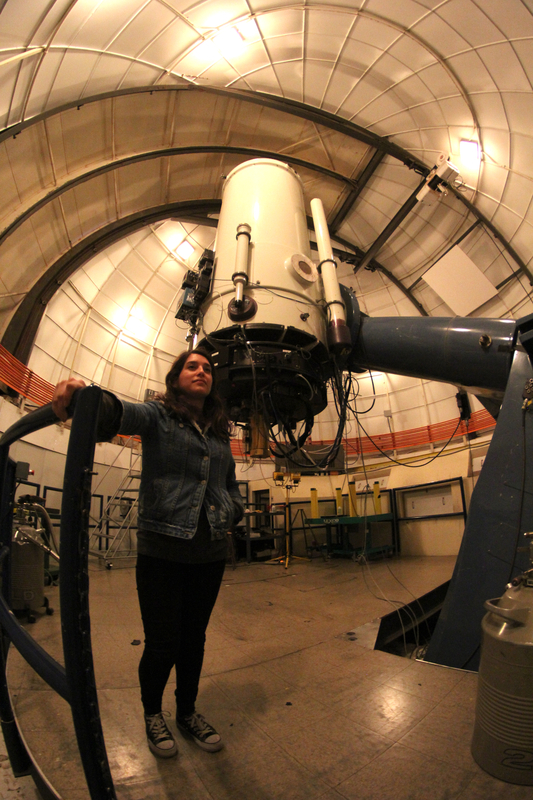 A woman of that new generation is Chilean astronomer Natalie Ulloa. On August 17, 2017, Ulloa was on duty at the Las Campanas Observatory in northern Chile, when an event never previously witnessed in the world of astronomy took place: a gravitational wave was detected, generated by the collision of two neutron stars. 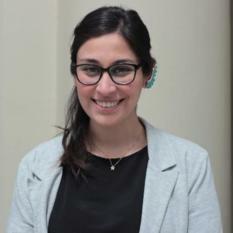 Natalie Ulloa saw in visible light the collision of two neutron stars with the smallest telescope in Las Campanas Observatory. That day in August, the gravitational waves were detected using specialised instruments belonging to LIGO in the United States, and VIRGO in Italy. Subsequently, using the FERMI and INTEGRAL space telescopes, a strong explosion of gamma rays was also detected. This put astronomers around the world on full alert, and the search began for the astronomical object behind the explosion. “That night I was heading the search, but everything was so secretive that even I didn’t know what I was looking for; they just told me it was something very important,” Natalie told me in an interview. A month later, it was revealed that she had been the first person to record a visible light image of the astronomical phenomenon, and her curious achievement led her to co-author papers that would be published in Science and Nature. “It was like being in a movie,” says Natalie. What director would turn down the opportunity to make a film starring characters like these, and in a landscape that could so easily be the Martian soil? I can just imagine Robert Zemeckis telling the story of a geologist discovering, in the driest desert in the world, a meteorite that is the first of its type. Hang on...that actually happened. That geologist is Millarca Valenzuela, who owns one of the biggest collections of meteorites in Latin America, and inspired the naming of asteroid 11819 Millarca, located in the main asteroid belt. Millarca lived her entire life near the Atacama Desert and is no stranger to its mysteries. She has dedicated her life to study the meteorites that fell into the desert that she could see from her backyard. Now, she is currently working on proposed legislation to protect space rocks that fall to Earth in our country, along with the craters left by their impact. Her aim is for these artifacts to be protected to the same extent as national cultural heritage, owing to their relevance to research. For her, these rocks are the link between the sky and the Earth. Her area of research, and the artefacts she seeks to protect, are of considerable interest to science. I don’t just say this because I myself love the subject: she made the same statement during an interview with the Chilean National Commission for Scientific and Technological Research (CONICYT). 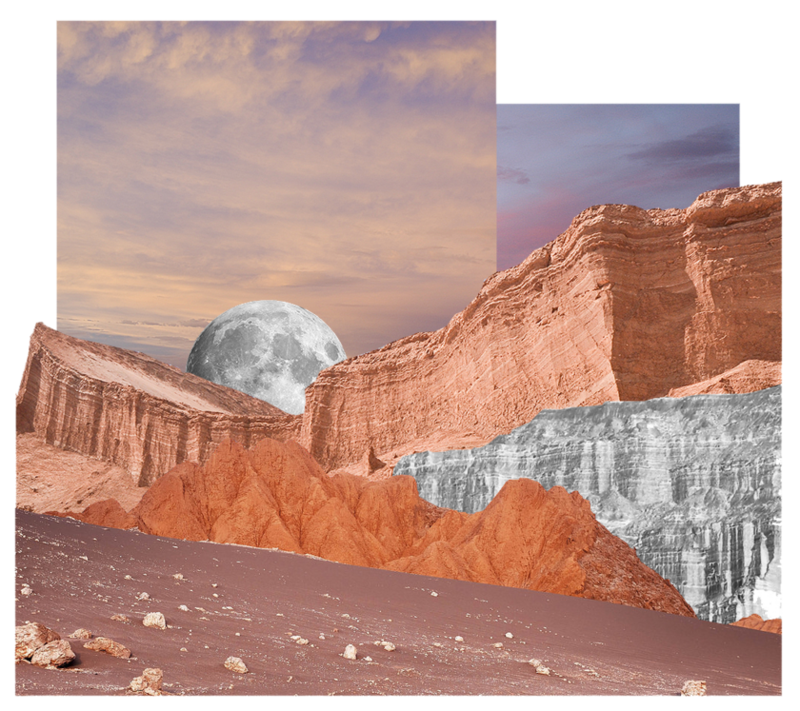 Collage of The Moon Valley, part of the Atacama Desert, capital of the astronomical observation. American Girl knows the importance of having the right role models. In their own words, we need “real-life individuals as well as fictional characters whose narratives help girls think about their own character, their own aspirations...” And precisely because I agree with this argument is why I won’t accept the fact that the Chilean part of Luciana is just incidental. I don’t want to blame it all on American Girl. They can’t carry the heavy burden of years and years of international women’s invisibility in science, but what if we honor the fact that this is 2018 and not 1910 and start to make ALL women visible? All over the world? Does that sound crazy? Would you like to increase these women’s work visibility? Cite them in your papers; invite them to participate in your conferences and ask them to join your work teams. As we well know, in the Southern Hemisphere there are constellations that are not visible in the North, and without bringing together the knowledge of a northern observer with that of one from the South, we would have no idea of something so basic today as to what lies above our heads. We are wasting an awful lot of smart people just because they don’t live nearby. Now, more than ever, it is vital that we break down borders, both geographical and mental, in order to resolve the global humanitarian, scientific and technological problems of today. I can’t see another way of getting Luciana to Mars. A disappointing blog. As much as I agree with the sentiments expressed, this is not the forum for that. Thank you for writing this, this is precisely the forum for this article. I grew up reading the American Girl books, and the spunky girls within them helped me to get where I am today as a young woman working in the field of planetary science. Because of this, I was incredibly excited that the Girl of the Year this year wanted to study planetary science, and it's even better that she's Latina since we don't see many Latina scientists in media. I'd been looking forward to reading these books, and it's disappointing to hear that they did not really acknowledge her heritage in them. Hopefully the third book will deliver what it promises. We need diverse role models for girls, both in fiction and in real life.